On May 18th and 19th the Sac City Panthers Men’s Track & Field team competed for a State Championship in San Mateo against over 40 other schools. The Panthers came up short in the end finishing in 3rd place overall…or so they thought, and would keep thinking until the COA announced 4 months later that Pasadena City College permitted the participation of an ineligible student athlete. The California Community College Athletic Association (CCCAA) issued a final ruling that eliminated the ineligible player and his points earned at May's State Meet in San Mateo. After a recalculation of the team points, Pasadena City College went from first to fourth place, while the Sacramento City College Panthers moved to first place and the rights to the State Championship. It was the Panthers 3rd State Championship in school history and their first title since 1942 – their other title coming in 1935. Considering it has been 65 years since the Sac City Men’s Track & Field team won a State Championship, the 4 month delay in the announcement of the Panthers State Championship seems pretty insignificant! ** High jumper Kurtiss Dilley became the 42nd State Champion in S.C.C. Men's Track & Field history when he repeated as state champion at the 2002 State Meet. The 1941 Panthers won the first of 2 straight NJCAA National Championships. Joe Batiste was the national champion in the high jump and the 220 yard low hurdles. Vernon Cooley won the pole vault with a meet record 13'7". Other team members who placed at the meet included Harvey Sullivan, Lee Angelich, Don Welcher, Irvin Schopp, Jim Lytjen, Bob Ehrman, and Ted Jefferson. Cooley, Welcher, and Batiste were named All-American, and Batiste was the co-winner of the Outstanding Athlete Award. The Panthers won the National title again in 1942 (and the state championship as well). 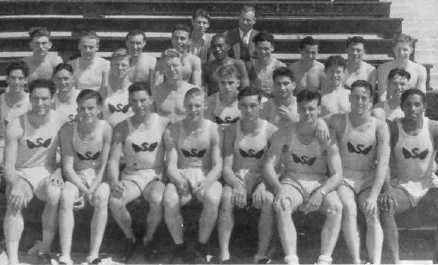 The 1935 track and field team won the first of 8 consecutive league championships and won the first of 2 state championships (as determined by the Fresno Relays). Claude McWilliams led the way by winning the 100 yard dash and the broad jump. Jim Humphreys won the 120 yard high hurdles, while Bill Fosket, Eldred Ramos, and Leslie Watson were champions in the shot put, pole vault, and high jump, respectively. The mile relay team of Jack Snodgrass, Leddy (first name unknown), Jessen Calleri, and Miller (first name unknown) won their event in a school record 3:23.0. Henry Hines set the national junior college record of 26'2 3/4" in the long jump in 1969. He was the state champion in the event as well, leading the Panthers to the state runner-up position. In 1971, Hines, who competed for the University of Southern California, had the longest long jump in the world and was the NCAA indoor national champion. He repeated the championship in 1972 and was the national runner-up at the 1972 NCAA outdoor national championship meet. In 1937, at the first night track and field meet at Sacramento Stadium, Jerry Lopes, the 1936 high school state champion in the 880, broke the national junior college record in the mile with a time of 4:20.6. In 1934, Tom Moore (middle, above) set a national junior college record with a time of 14.5 in the 120 yard high hurdles. On May 11, 1935, while competing for the University of California, Moore tied the world record in the event with a time of 14.2 at the West Coast Relays. He remains the only former Panther to set a world record. In 1996, Moore was a member of the first induction class into the SCC Athletic Hall of Fame. George Stanich is the most versatile athlete in SCC history. During the 1946-47 school year, Stanich was the leading scorer on the basketball team as well as the leading pitcher on the baseball team. He was the league champion in the 120 yard high hurdles and high jump. He was also the runner-up in the high jump at the West Coast Relays (state championships). He pitched the league clinching baseball victory a day after posting the highest junior college high jump in the state for the year. While Stanich went on to become an all-American basketball player at UCLA in 1950 and had a 5 year career as a pitcher in the Pacific Coast League, his greatest achievement occurred in 1948 after his sophomore season at UCLA. After being the 12th man to qualify for the U.S. Olympic Trial finals, he earned a spot on the US team and won a bronze medal at the 1948 Olympic Games in London. Jack Parker was 19 years old in 1936 when he represented Sacramento Junior College on the United States Olympic Team. Parker was the only one of 10 current or former SJC athletes who competed in the trials that year to make the team. He earned a bronze medal in the decathlon at the 1936 Olympics in Berlin. His school record decathlon score of 6760 was tied in 1986 by Kevin Madden. In his only season as an SJC Panther, Frank Kaiser was the national champion in the 220 and 440 yard dashes in 1942. His 440 time was a national junior college record and stood as a national meet record for almost 20 years. He was also the state champion (Fresno Relays) in the 100 yard dash. Towards the end of the school year, Kaiser set a junior national record when he won the 400 meters at the 1942 Junior AAU championships in Philadelphia. His time was faster than the NCAA champion for that year. Joe Batiste - "The One-Man Track Team"
Joe Batiste was the greatest track and field athlete ever to compete for the Panthers. In 1942, he led the Panthers to the state championship (Fresno Relays) as well as their second consecutive national championship. He capped off his SJC career by winning both hurdle events, placing second in the 100 yard dash and the broad jump, finishing third in the javelin and the discus, and placing fifth in the shot put at the national meet in Denver. Batiste left SJC as a 4-time state champion (120 yard high hurdles [twice], broad jump, high jump) and a 4-time national champion (220 yard low hurdles [twice], 120 yard high hurdles, high jump). Batiste was an AAU national runner-up for 3 straight years after winning the national championship in the 110 meter high hurdles after his junior year of high school.